The Schmidt Center Gallery and Schmidt Center Gallery Public Space will be open by appointment and 1.5 hours prior to each showing at FAU's Studio One Theatre. Click here for the Theatre summer schedule. When visiting the University Galleries, please be sure to visit the Information Booth located at the entrance of the FAU Boca Raton campus. Directions to your most convenient parking location can be obtained here. 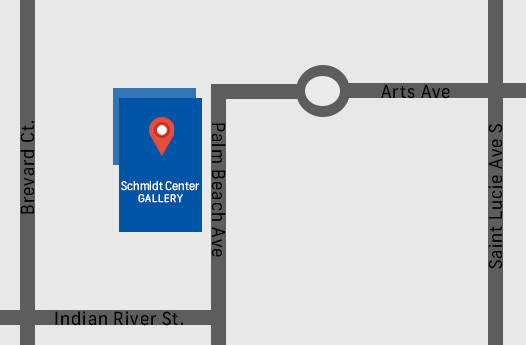 The galleries are located on Broward Avenue, near the Glades Road entrance at NW 10th Street. Click here for walking directions to and from the Schmidt Center Gallery and the Ritter Art Gallery. Click here for the FAU OwlExpress Shuttle Route Map. Click here for the FAU Parking Lot Map. From I-95 North/South, exit onto Glades Road, heading east. After exiting the Information Booth, make your first right turn onto Indian River Street and go straight through the stop sign. Turn left at St. Lucie Avenue South. Continue until you reach a 4-way stop sign. Make a left onto Arts Avenue. With your visitor's pass, you may park in the parking garage to your left before the roundabout. From the garage, walk west towards the University Theatre. Once past the building on your left, take a left. The gallery is located in the Performing Arts building, which is marked by a tall, white cubicle tower. The Schmidt Center Gallery is located halfway down the hall on your left. (the visitor's pass will not work here). After exiting the Information Booth, continue north through your first traffic light. Turn right at Volusia Street (the second traffic light), noticing a 4-story parking garage on the left. Continue straight until the road turns to right. Turn into one of the first driveways to the left to enter the parking lot in front of the S.E. Wimberly Library. Walk to the area adjacent to the entrance to the Library. 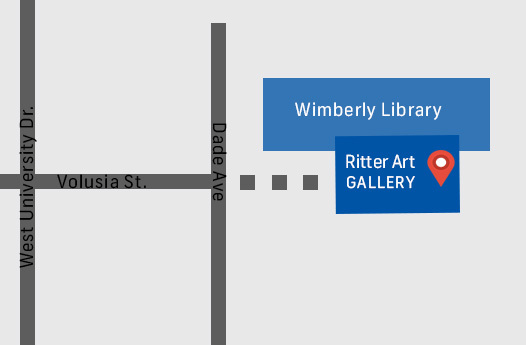 Look up to the east and notice a blue sign that says "Ritter Art Gallery" on it. You must walk under the breezeway past the Chick-fil-A (to your left),and head east until you intersect a longer breezeway. At the longer breezeway, turn right and look for signs and a stairway headed up to the Ritter Art Gallery entrance.